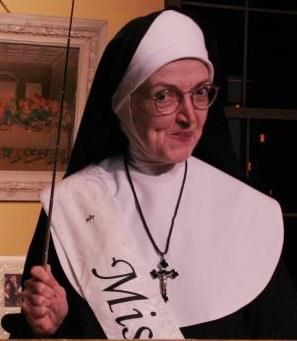 Many audience members think that Mary Zentmyer is a bona fide nun. 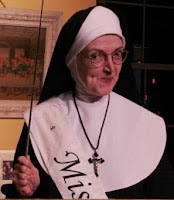 That’s true testament to this actress’ skills in her performances of Sister, star of “Late Nite Catechism.” Having donned the habit for a good part of the last 15 years, Zentmyer was one of the first Sisters cast in the role. She was auditioned by the play’s writer team of Vicki Quade and Maripat Donovan. There are now approximately 20 Sisters touring throughout the country. Zentmyer describes her role in three parts: acting, improve, and stand-up comedy. The thought of memorizing a 25-page monologue was scary at first. “This is not your typical play. It’s very interactive,” she said. “It’s a memory play, a nostalgia play. I connect with the people,” she continued. The target audience is former students (including herself) who experienced the nuns that resembled Army drill sergeants. “We thought they were mean, but it’s no wonder they were cranky, because they wore 20 lb. wool garments every day, all year round,” she laughed. Sister’s strictness is the best humor of the play, and the audience response is incredible. She pokes gentle fun; the show is never mean-spirited. Zentmyer has been on the road for most of her career due to her repeat performances primarily in the mid-West and New England. They keep calling her back! “People have been so nice to me. Being a one-woman show, they see that I’m alone and invite me to dinner,” she laughed. The best part of the experience is the Meet & Greet post-performance. It’s like confession, with lines of audience members, each telling stories from their youth. Asked: do you have to be Catholic to ‘get’ the show, she replied that it does help the audience ‘get’ the full humor. “It plays well to all religions and regions,” she responded. We all like to go back to a different time in our lives, even remembering strict teachers. The show is already sold out for her upcoming run in Detroit. “Middle-America Protestants enjoy it. And New England, with lots of Catholics, certainly ‘get’ it,” she continued. “Making people laugh for a living – it’s the greatest job,” Zentmyer said.